The Bald Eagle Area School District is located in northern Centre County, Pennsylvania. The District serves 12,882 residents in the boroughs of Howard, Milesburg, Port Matilda, Snow Shoe and Unionville, and the townships of Boggs, Burnside, Howard, Huston, Snow Shoe, Union and Worth. Given its 342.6 square mile geographic reach, Bald Eagle schools have become educational and community resource centers. Recently, the school administration discovered how StrandVision Digital Signage can help meet its multiple missions. 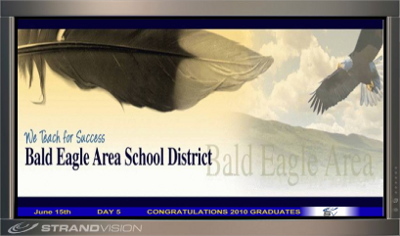 Bald Eagle Area School District (BEASD), consisting of a middle-high school and four elementary schools, serves two constituencies in Centre County, Pennsylvania - students and the community at large. Since the 970-student middle-high school is centrally located and the building is heavily used every day and evening by community groups, they wanted the digital signs to alert people to meetings and events as they enter the building. Information throughout the day on after school activities and late buses, schedule changes and cancellations must be communicated efficiently since the District runs late buses at 6:00 and 8:15 PM to accommodate students' sports and activities. The signage also provides students, parents, visitors and the school board with pictures of student activities, awards and recognition to build community. Finally, the digital signage network also streams live video. This capability is used to include overflow crowds attending community events held in the gymnasium. The audience views the proceedings on 60" digital signage video monitors in the cafeteria. The digital signage displays in the cafeteria are augmented by additional displays in the lobby and hallways. Student and community announcements are updated every day. The school secretary posts the administration's announcements and bulletins each morning and adds special announcements, schedule changes and cancellations throughout the day. Another staff person posts club notices, as well as photos, videos and other announcements submitted via email. Two other staff are authorized to submit content through the StrandVision Web-based dashboard. The digital signage network was integrated into the school's existing cable network. Explained Bill Corkill, BEASD Instructional Technology Specialist and Activities Director, "We first looked at doing our own signage. But the StrandVision price point was so good that we decided to use the service that they offered." John Urbanik, Network Administrator, identified a used computer to drive the system and worked with the maintenance staff to extend the network and install the displays. The StrandVision Digital Signage system is working well and performing up to expectations. Explained Bill, "At first, students were somewhat skeptical about signage. Now, it's a part of the school day." It's become part of the community too. "We run pictures of the students receiving awards or other recognition at our school board meetings that are held in the cafeteria. People love that the students are recognized outside of the actual award ceremony. We receive lots of comments on that," Bill concluded.